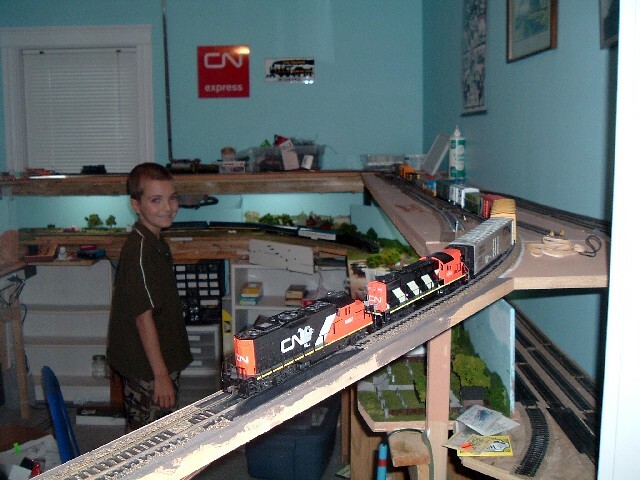 I recently took down the web page for my second model railway layout, the Nova Scotia Eastern Railway (NSER), a freelanced shortline railway based on a prototypical railway. I had written the web page as if the NSER was a real railroad. Welcome to the home page of the Nova Scotia Eastern Railway. We serve the Dartmouth area of Nova Scotia with quality, efficient freight railroad service. Our track extends from the Eastern Passage through Dartmouth to our interchange with CN at Windsor Junction for a total of 29.6 km (18.5 miles). We serve numerous industries in the area, including the Imperial Oil refinery in Dartmouth, the Autoport in Eastern Passage and industries in the Burnside Industrial Park. Please contact us for your transportation needs! I wrote a history of the railway as well. I highly recommend doing this to help flesh out the story of your railway. In the NSER’s case it was presented as a shortline that took over the CN Dartmouth subdivision (which in my world, still ran to Upper Musquodoboit). The NSER and the other shortlines in Nova Scotia, the CB&CNS and the Windsor and Hantsport, formed an association (Nova Scotia Shortlines) to facilitate cooperation and car exchanges between the shortlines. The CB&CNS and the NSER in particular are very close together (they both terminate in Windsor Junction) and wished to exchange cars without CN’s involvement. After some negotiations and the involvement of the federal Transport Minister, they gained running rights over a short portion of track in Windsor Junction to allow them to interchange traffic. In 1995 the provincial government was approached by a tourism operator, Scotia Tours, interested in operating excursion trains over the abandoned trackage to Musquodoboit. Some negotiations took place but CN was not interested in providing access to their portion of the Dartmouth Subdivision. Once CanRail took possession of the subdivision, negotiations were reopened. CanRail and the province agreed to allow Scotia Tours to operate a daily excursion train over their trackage, and the province invested approximately half a million dollars to upgrade the line, replace signals and crossings, etc. to permit safe operation on the line. Scotia Tours acquired a steam locomotive, CN 6043 from Assiniboine Park in Winnipeg, and a few former CN passenger cars. It leased a portion of CanRail’s Dartmouth yard to house the engine and cars, and began tours in May 1998. In 2001 the Campbell Forestry company (owners of forest land, pulp and paper mills in New Brunswick and Maine) decided to make an investment in the Nova Scotia forestry market. They purchased the MacTara lumber mill in Upper Musquodoboit. CanRail approached Campbell Forestry to provide transportation for their wood products from Musquodoboit to Dartmouth, with CN taking the shipment from there to Saint John, NB for shipment to the United States on the NB Southern Railway. CanRail leased the trackage from the province for a period of 20 years, and began operations on the line in late 2001. The majority of the traffic is either cut wood (to the mill) or finished lumber (from the mill), with the occasional boxcar or gondola for other industries in the area. Traffic on the NSER is typical of many shortlines. The industries located on its line (the Imperial Oil refinery, the autoport, the Campbell mill, and several smaller industries) provide the bulk of traffic that is interchanged with CN at Windsor Junction. Two or three times daily, a unit train runs from Windsor Junction to Burnside under CN control to deliver gypsum to waiting ships. As well, a train is infrequently run from Dartmouth to Windsor Junction to interchange with the Windsor & Hantsport. Scotia Tours’ excursion train provides a glimpse of yesteryear with its imposing steam engine and passenger cars. 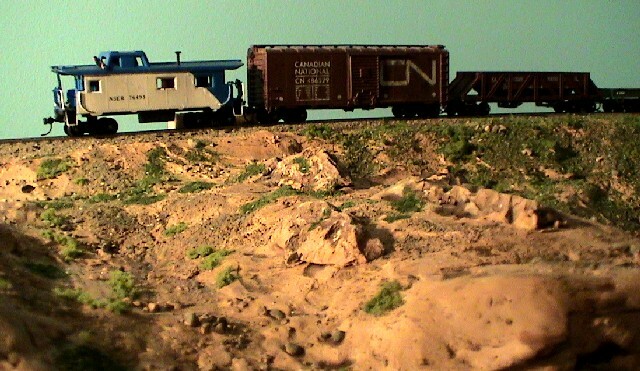 I had/have one caboose and one passenger coach decorated for the NSER in white with blue trim. There was staging on the right, behind a backdrop, leading into Windsor Junction and an interchange with the Windsor & Hantsport Railway. The tracks then went to Halifax staging on the left, with a long and steep climb to the second level. Most of the top level was never built. I think it was too ambitious, honestly. The NSER was a great learning experience.